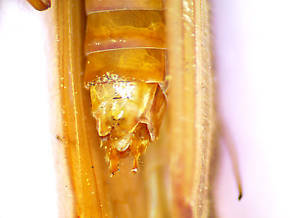 Male Psychoglypha (Snow Sedges) Caddisfly Adult View 2 PicturesThis Psychoglypha adult was found clinging to my garage door in the evening on April 9, 2013. It measures 21 mm in length, from the front of head to the end of wings. It is my hope that Creno will be able to identify it to species based on the image of its genitalia. However, if other images are required for a species ID, the specimen is available, so they can be easily taken. Thanks, Roger Rohrbeck, Mercer Island, WA.